Topic December 2016 / January 2017. Seeking the causes of the breakaway of the Canadian Division: a more complicated story than at first seems likely. Surprisingly, the seeds of the problem can be traced back all of thirteen years to the death in 1925 of Cdt-General Tamplin. Colonel Herbert Tamplin was a much respected Cdt-General who was regarded with affection by the Frontiersmen. He had been an unspectacular middle-ranking officer in the Boer War. His great success was bringing in Lord Loch as President of the Legion. Loch was a man of great influence with friends in very high places and he did a lot for the Frontiersmen. Bringing in Lord Loch may have been the greatest action Tamplin did for L.O.F., however his steady hand at the helm when the Legion was trying to re-build after the losses of WW1 was of almost equal importance. When Tamplin died there was no obvious successor. The Legion treasurer, Arthur Burchardt-Ashton, took on the position of Acting Cdt-General but refused to accept any substantive Legion rank higher than Legion captain. Burchardt-Ashton was “Acting C-G” for the whole of his time in office. His great advantage was that he was seriously wealthy and many times funded L.O.F. out of a desperate financial plight. The Legion subs were very low as the working man could not afford much, so he subsidised it very quietly and himself paid some of its outstanding debts. But, and it is a big but, Burchardt-Ashton had no campaign medals to wear as during the Boer War he had been in Hawaii and he was too old to serve overseas in the First War. His favoured assistant was H.C. Edwards-Carter about whom there were split opinions and who also had no war medals to wear. They were trying to lead men who had faced, and had seen, death at first hand. In 1927 those unhappy with the leadership of Burchardt-Ashton and Edwards-Carter (who during much of the war had been involved in munitions manufacture in England) broke away to form the “Independent Overseas Command of the Legion of Frontiersmen.” Although they had enough articulate members to become organising officers, they did not attract many of the rank and file Frontiersmen. Their terms of membership were very strict. The fighting soldier had a poor opinion of men who had earned good money back in Britain making munitions, when other men had faced death every day. Lord Loch and the powerful men on the Legion Grand Council must have been horrified by the turn of events, especially when after much consideration and lobbying the application was made in 1933 for a Royal Charter. The Legion had many powerful supporters including Lord Derby and the Duke of Portland. To the disgust of the Grand Council, I.O.C. filed an official protest and a counter-petition, making some strong complaints about the Legion leadership and senior officers. Brigadier E. Morton appeared suddenly out of the blue in 1932 as an officer in the Legion’s London Command. Our belief is that Lord Loch asked the W.O. for a retired officer as a safe pair of hands for the L.O.F. Although not an official body, they were called on regularly as Royal bodyguards. Loch would have been concerned at the depth of feelings about Burchardt-Ashton and Edwards-Carter. No doubt there were rumours that Edwards-Carter had been forced in 1914 to resign his commission as a captain in the Royal Warwickshire Regt. due to his bouncing cheques. Lord Loch, as a retired Major-General would have easily discovered that the rumours were true. The Frontiersmen had also been called for to be on duty at the funeral of King George V.
A representative detachment of Frontiersmen was invited to participate in the funeral of His Late Majesty. It was allotted a position at Hyde Park Corner and, being asked to assist the police to keep the crowds from invading the route, was able to render some slight service for which the Legion was subsequently thanked by the Asst. Commissioner of Police. (The Frontiersman magazine, February 1936). Another reliable retired army officer in the person of Colonel E.C. Dunn suddenly appeared on the Legion’s membership and became Morton’s Chief-of-Staff. The problem with this, although it was not recognised at the time, was that you now had a powerful body of trained men all around the old British Empire with the Commandant-General in a position to give orders with no real challenges possible to this. It was not until the 1970s when there were worries (unjustified) of political infiltration that what had become the Ministry of Defence insisted that the Legion must be governed by an elected Council of Frontiersmen representing all units around the world. Morton would be remembered today as the man who steered through the negotiations to re-unite L.O.F., had it not been for his ill-judged action over Canada when he acted as if he was still in the army and could give an executive order that would be obeyed without question. L.O.F. has never worked like that. As it is, Morton is remembered as the one who caused such bitterness in Canada that it has taken nearly eighty years to heal the wounds. There is evidence that Morton was capable of impulsive actions. In July 1939, by overtaking very rashly when driving his car, he caused a serious road accident. He could easily have caused death or serious injury and was prosecuted for his bad driving and found guilty. In spite of his success, what Scott could not solve was the perennial rivalry between Western and Eastern Canada, and also, to a lesser extent, the independent spirit of coastal British Columbia. Another success for Scott was the granting of a Dominion Charter, something Imperial Headquarters had not been able to achieve in Britain. What Scott did not do was to involve anyone from outside Alberta in the official application, not necessarily a wise diplomatic move. He did refer his application to I.H.Q. in London. They seem to have given it no more than a cursory glance without studying it deeply and passed it back as approved. They then forgot they had approved it, which was another mistake. Canadian Division began to recruit successfully in Eastern Canada, especially Quebec, in the mid nineteen-thirties and believed their numbers to be greater than Western Canada. Whether or not this was true cannot be proved, but it certainly grated with the members that they were responsible to Edmonton for everything. The commanding officer in Quebec, Capt. Maurice Fitzgerald of Loretteville was a very enthusiastic Frontiersman, but his military record has not been fully uncovered. He is believed to have been an engineer officer in the First War, for some reason in the United States Navy. In civilian life he managed a business owned by his father-in-law selling items such as snow-shoes and canoes, manufactured by a local First Nations tribe. In 1935 the Founder had undertaken a recruiting World Tour for the Frontiersmen. The final leg took him across Canada from west to east. As well as visiting many Frontiersmen units, Roger Pocock met many in authority in Canada, especially in the R.C.M.P. where he was still held in respect, as he had never ceased to champion the Force. In 1939 the visit of King George VI and Queen Elizabeth to Canada called the Frontiersmen into action as a successful and efficient back-up to the R.C.M.P. This was to be the high point, as in October 1939 the R.C.M.P. terminated the affiliation due to the internal squabbles and divisions within the Legion. What had happened to cause this? Louis Scott was a strong leader, but that was not enough. He was not in a position to travel across the country to west and east – a time-consuming and costly exercise in those days. There were also political rivalries between the Prairie Provinces and Eastern Canada. Although they were happy to have orders from their Imperial Headquarters in London, the Eastern Canada Frontiersmen objected to being commanded by a man who they had never met and who was from a Prairie Province. As to British Columbia, the Frontiersmen there considered themselves closer to the British Mother Country than any other Canadian Province. Until evidence came to hand, the accepted version of events was that of Scott’s Frontiersmen published in their own Canadian journals. It was claimed that Capt. Fitzgerald of Eastern Canada travelled to London where he met Cdt.-General Morton and persuaded Morton that Canada was too big to be run by one man. Morton agreed and directed that Canada should immediately be split into two Commands, Western Command under Scott and Eastern Command under Fitzgerald. It now seems certain that Fitzgerald himself never visited London. In Edmonton we have four Squadrons…The O.C. of …. Squadron is not a fit person to wear the uniform of the Legion of Frontiersmen. There is not a Parade or meeting that doesn’t turn out to be a drinking bout. This while in uniform…We have Capt. ….., who is a Drunkard and is despised by everyone who knows him. There is [sic] very few people who have not seen him at some place making an exhibition of himself…since I have mentioned the R.C.M. Police I might state that although they are proud to be associated with us in other parts of Canada, they do not think very highly of the majority of Frontiersmen here. Scott was a clever man who was able to run rings around Fitzgerald and his supporters. Scott had gained the Dominion Charter mentioned by Blain, but this nearly turned the Canadian Frontiersmen into a private company. IHQ had indeed been told of the Charter, but had not been sharp enough to demand details in advance. Refusing to accept the division of the Legion in Canada, Scott broke his Canadian Division away from IHQ and used the Charter to prevent Eastern Canada from using the title Legion of Frontiersmen. The Canadian Secretary of State eventually told both parties to concentrate on the War effort. When the War ended a new attempt would be made to resolve the problem. The Legion President, a highly distressed Lord Loch, had involved his many influential friends without success, but he indicated that after the War he would make a special trip to Canada to seek a solution personally. Unfortunately he died in August 1942. At the end of the War Britain was exhausted and the British Frontiersmen needed to concentrate all their efforts on rebuilding the Legion there. And so the dispute continued to simmer. Had Morton consulted Roger Pocock early on with the full story, he could have contacted his many friends in Canada and probably resolved the matter. Morton did not; Pocock only heard Scott’s side and angrily supported him. A sad example of arrogance of one man at the head causing untold harm to an organisation. Had so many mistakes not been made, the Legion might currently still be proudly claiming that affiliation to the R.C.M.P.. Secure in his position and knowing that the Frontiersmen were being called upon all around the world to assist the local authorities, Morton made an executive decision as if he was still a serving army Brigadier. By that one mistake, all his successes as Cdt-General would be ignored and his time at the head of the Frontiersmen would be remembered by that one decision, which was to have repercussions that lasted for almost eighty years. He had forgotten, or ignored as unimportant, the Dominion Charter of Canadian Division, which was under the control of Scott and his senior staff in Edmonton. Fitzgerald began a recruiting drive which was highly successful with men who did not wish to be beholden to Edmonton, Alberta, but to their own region of Canada and from there only to Imperial Headquarters in London. Morton’s staff asked for the Canadian Charter to be passed to his headquarters, claiming that the request for the Charter had not been authorised. Scott immediately produced evidence that it had indeed been authorised and also copies of letters granting him total control over the Frontiersmen in Canada. The R.C.M.P., who had thought that London HQ had control of the Charter looked on at the infighting with horror. Because of their concern at some of Scott’s officers, behind the scenes both they and the Government at Ottawa were quietly supporting Fitzgerald and advising him. In the end, matters became so bad that the R.C.M.P. could only withdraw the official affiliation of the Legion, although they still made unofficial use of favoured Frontiersmen units. An additional problem was that, as Scott had control of the Charter, he made it clear to Fitzgerald that he would happily make use of the law to prevent Fitzgerald’s Eastern Canada Frontiersmen using the title of Legion of Frontiersmen and wearing the Legion badges. Once again, Fitzgerald consulted the R.C.M.P. and the Government and it was decided that the name would have to be changed. So, Eastern Canada Command became the “Corps of Imperial Frontiersmen”‘, but still affiliated to and serving under the Imperial Headquarters of the Legion of Frontiersmen in London. Col. Dunn, Chief of Imperial Staff, followed with a review of the past ten years; a sorry story culminating in his reading a letter from the Commandant-General (Brig. Morton) announcing his resignation, a retirement which was accepted without comment or protest. And so another leader of the Legion of Frontiersmen passed from our ranks into the shadows of obscurity. Not “obscurity”, but in fact to be remembered sadly not for his several successes, but for one major error of judgment, which was to have such serious consequences that they were last for more than a lifetime. At the 1950 annual meeting: A motion was then carried that an Executive Council as was functioning before Gen. Morton wiped it out should be elected. This attempt at explaining a painful event in Legion history is based on files of HQ letters etc. discovered only in recent years. We have concentrated on the errors of one man, rather than other contributory factors, as the errors of a Commandant-General with supreme executive powers were central to the story. Nowadays no one person can wield such powers in the Frontiersmen and because of that it is a better, even if smaller, organization. 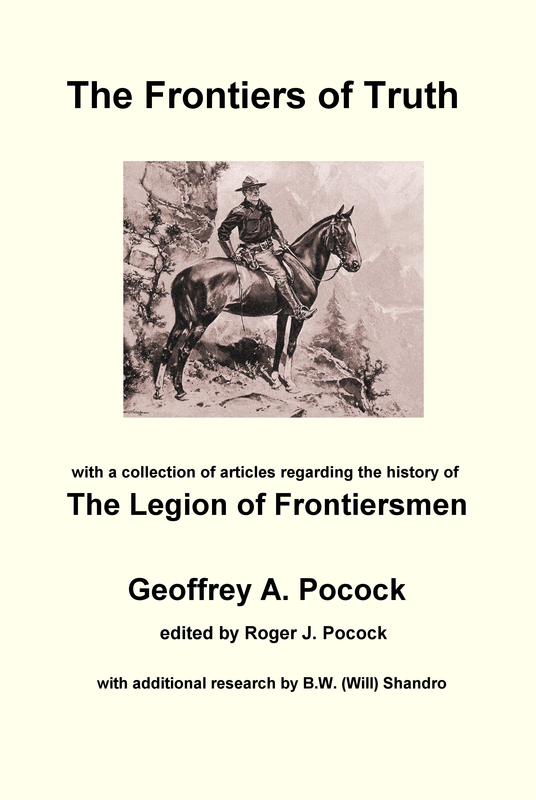 This entry was posted in Canada, Frontiersmen, History, Latest Topic, Legion of Frontiersmen. Bookmark the permalink.